It occured to me that in all fonts I know of, different characters have a different height. Why is this so? Are there fonts where all characters have the same height? If so, is there a name for this class of fonts? Of course it is understandable that a letter like Q needs to go below the baseline, such that it lines up well with other characters like O. Still, is there a font where no character exceeds the baseline? Second case, and this one is actually more interesting for me, it seems that letters like I, T etc are in general shorter than "rounder" letters like C or O. The rounder letters only overshoot the baseline by a few percent, but still this is quite annoying in certain cases; so I would like to know the reason for this, as well as any possible workaround, best of course a reference to a font where this does not occur, but also any explanation of this phenomenon. I did find this question about the same symptom, but it does not address the underlying issue at all. Capitals with curves are designed slightly larger than the other letters to counteract an optical illusion, which otherwise would make those letters look too small, even though in reality they wouldn't be. Here is an example. 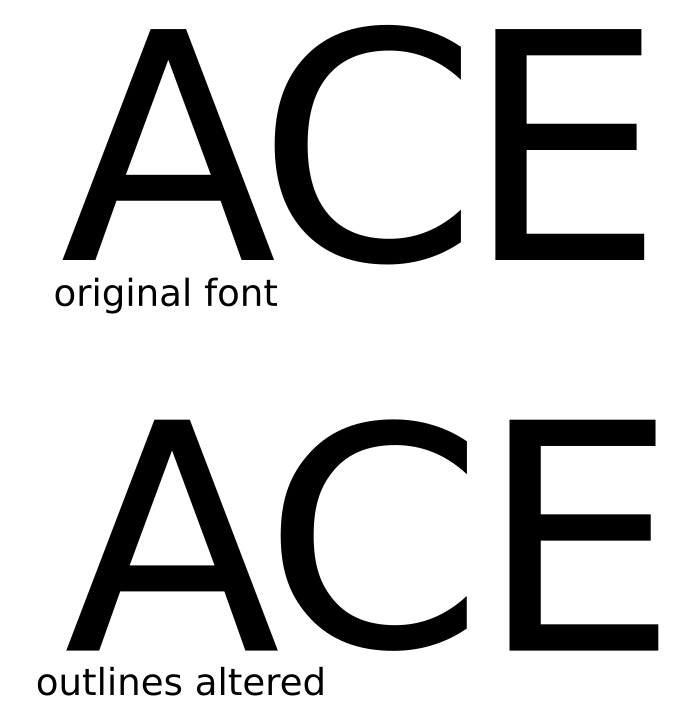 The top image is the original unaltered font. The bottom I have altered to make the top and bottom of the C match the letters A and E exactly. You may be able to find a font which has been designed that way, however it wouldn't be a good design if the letters look wonky (even though they aren't). 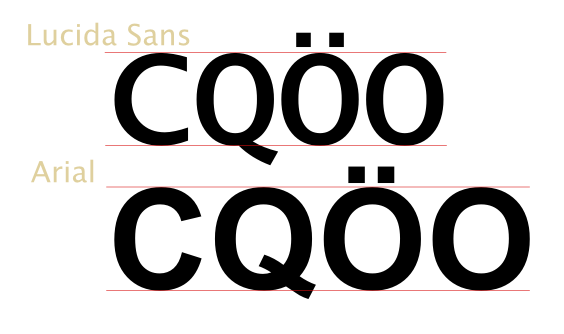 The construction of fonts changed after the 50s with the Swiss International Typographic Style. Many of the early International Typographic Style works featured typography as a primary design element in addition to its use in text, and it is for this that the style is named. If hand-made typography was the first design, and letters constructed on a grid appeared in the 18th century, then the 20th century and particularly the Swiss Style brought photographic reproduction as a crucial element for the design of its typography. Making giant photographic copies of each character, they could more easily find all the optical elements to modify to improve their designs. 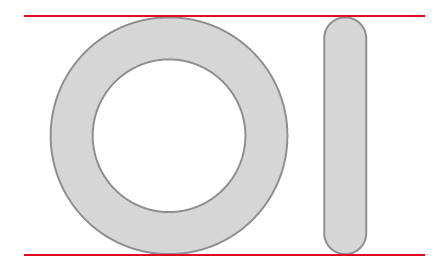 The rounded strokes exceed the limits of the baseline and the x-height so as to appear to be the same size as the characters with straight strokes. This happens with every character of the typefaces designed at this time like Helvetica, Frutiger and Univers, and from there all the classic fonts were redesigned, or rather restructured. In the 90s there was a movement in architecture, cinema, fashion, advertising and industrial design that defied all the established rules: Deconstructivism. In graphic design it was called Trash Design and one of its great challenges was to destroy all of optical typography's arrangements or at least create fonts with no such rules. The main exhibitors of those fonts were the magazines Emigre, Mondo2000 and RayGun. Although they seem very casual design typographies, they are classics today. Q: Is there a font that has the same size for every character? A: There is for every character in the font itself; but there's not one for every existing character. The fonts are incomplete, in effect. Q: Why is this so? A: Every character within a font is unique for readability. We must be able to differentiate one from the other to form readable combinations (words) that coincide with a unique meaning for each combination. 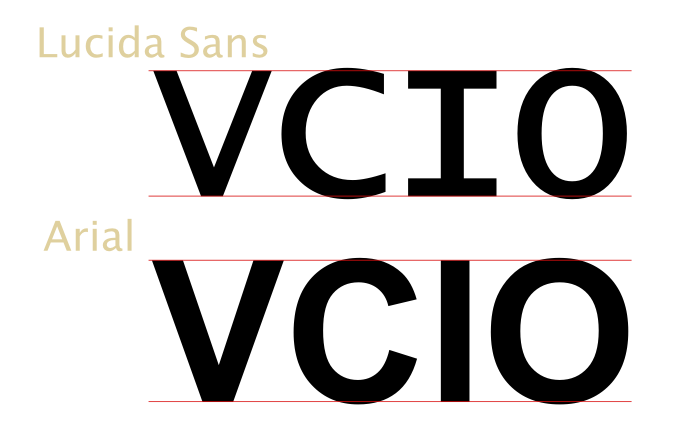 Our desire for continuity and uniformity is satisfied by the optical appearance of a font's component characters. 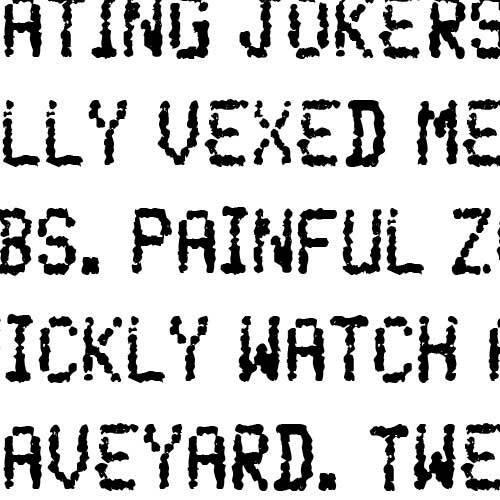 Typographers have modified the appearance to LOOK "right." The various slight irregularities metrically allow the appearance to be correct visually. Q: Are there fonts where all characters have the same height? The appearance of some kinds of lettering must be compromised metrically to comply with practical physical display restrictions. While not classified as high-quality fonts, their applications are specialized; but, they are often used for novelty applications in advertising and such. Their readability is high for their designed use while their legibility is moderate. Q: Is there a name for this class of fonts? Punch or impact (DYMO™) lettering has a fixed height for all glyphs. 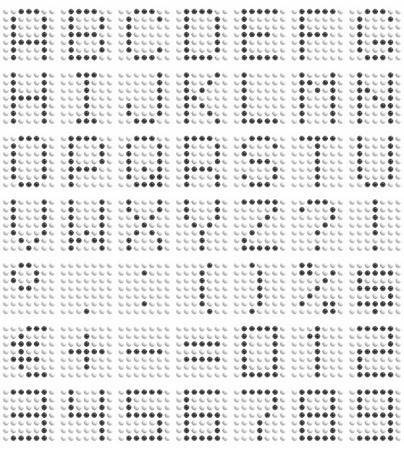 Dot Matrix fonts are also fixed height in various grid densities. Here is a 7x7 grid. Early Laser Diode thermal printers burned a fixed-height readout into receipts. This is based on a 6x8 grid. Any Chinese font would be the answer and I'm typing this to meet the minimum character requirement. You may be interested in seeing this image, which shows a digital font in traditional style which I believe was intentionally drawn with almost no overshoot. (It's based on a historical model.) Notice how in words like 'homme' or 'envie', where you have a round letter or 'v' sandwiched by straight verticals, that letter looks like it's floating above the baseline. Not the answer you're looking for? Browse other questions tagged fonts font-recommendation typefaces typesetting type-theory or ask your own question. What font has no descent? or How remove the descender of individual characters? What is the standard proportion of a font's descent? Are there monospaced fonts with the same pixel width for regular, bold, italic, and bold/italic?